When we got the diagnosis in January, I’d felt a huge sense of relief. We finally had answers to our many questions. We were certain of what I’d felt in my heart for a long time — my son, Jackson had childhood apraxia of speech. With diagnoses in hand, I set out to educate myself and others. I hit the ground running to make sure we were doing everything we possibly could for Jackson. What I didn’t do was grieve. Last week, the sadness and uncertainty nearly pulled me under. Somewhere between learning we needed to get an occupational therapy evaluation, realizing it’s highly likely that Jackson has sensory processing disorder and battling the school district to meet his needs, the grief found me. So I fell apart in the shower. I let the water muffle the sound of my sobs. At 2:00 a.m., silent tears hit my pillow. Jackson wasn’t feeling well, and it killed me that he couldn’t tell me what was wrong. And I fell apart again — right there on the exam table — while my doctor hugged me. Grief found me last week. I grieved for the little boy who wants so desperately to talk. I grieved because we have a long, hard road ahead. I grieved because my 3-year-old should be signing up to play soccer or participating in activities with other kids. I grieved because being the parent of a child with special needs is hard. I grieved because few people truly understand what we face on a daily basis. This apraxia journey is a roller coaster ride. There are days I feel strong and capable — Jackson’s biggest advocate. Other days I question my ability to get it right. I never realized I’d be fighting so hard for my son when he was just 3 years old. I never imagined I’d be worried about IEPs and making sure people see him for who he truly is and not the labels they want to slap on him. Yes, there are days I feel defeated and frustrated — but hope always lingers. Oh, how I’m grateful for the joy discovered amidst the difficulties. Easter egg hunts. 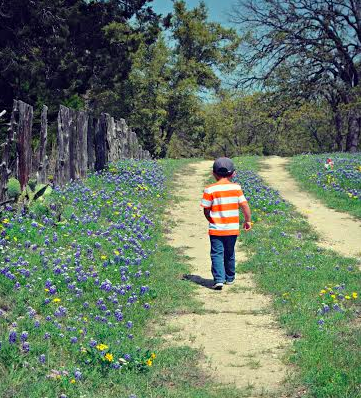 Texas bluebonnets. Ice cream for dinner. I love this little boy entrusted to me. This post originally appeared on JenniferJacksonLinck.com. Jennifer Jackson Linck is the mama of a 3-year-old who is still trying to find his voice. She writes about faith, motherhood, adoption and Apraxia at jenniferjacksonlinck.com. She is also the author of Bringing Home the Missing Linck: A Journey of Faith to Family.